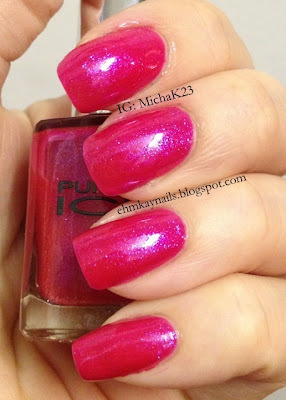 Here's a quickie NOTD, Pure Ice Tease, which was discontinued. 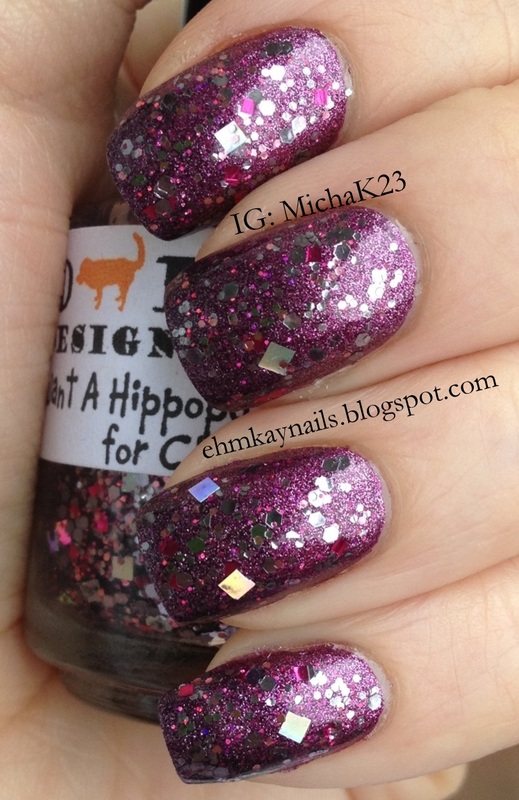 A vibrant but sheer hot pink with a crazy blue shimmer. It is super sheer and this was three coats and could have used a fourth coat. Next time, I might layer it over a similar bright pink. After I wore it, someone in one of the nail polish groups I am in mentioned this looked similar to the base of Hare Atolla. 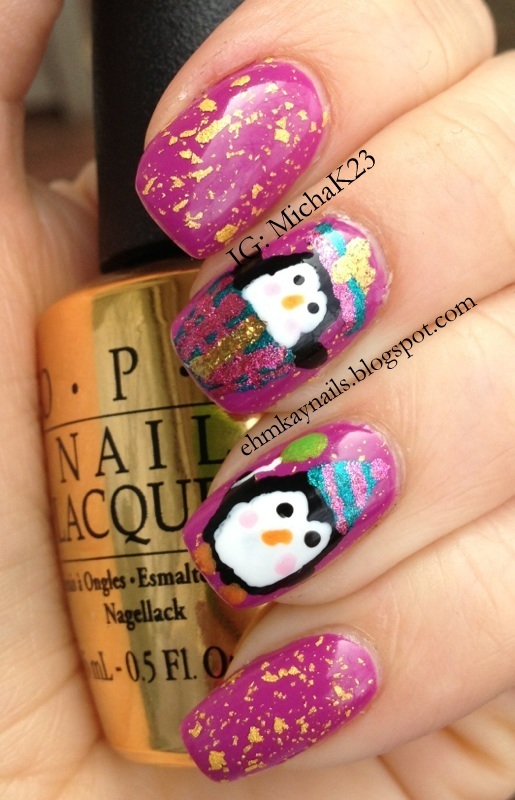 I see some awesome layering combos with China Glaze Snowglobe in the future. 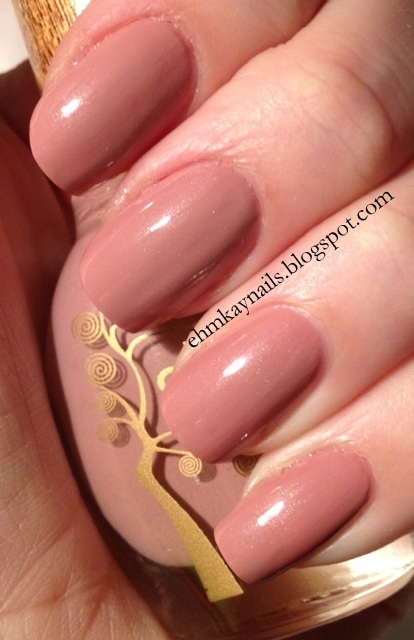 What do you think of this discontinued color? My mom's birthday was a week ago and it was a milestone! So to celebrate, I decided I needed some gold on my nails. I saw a Christmas ornament at Pier One with a penguin in a gift, so I took inspiration from that and painted on some birthday penguins! I started with Zoya Audrina which Zoya describes as a "very bright funky mix of medium pink and purple with a milky creme finish." I used two easy coats. It was bright but dark enough to allow the gold to pop. Then I did one coat of SOPI 18K top coat. Because I wanted more gold with larger flakes, I then used OPI The Man with the Golden Gun, which is especially amazing because a dear friend RAOK'ed (Random Act of Kindness) it to me when I couldn't find it! Thank you, polish fairy! We threw my mom a surprise party and I insisted doing her nails that day. 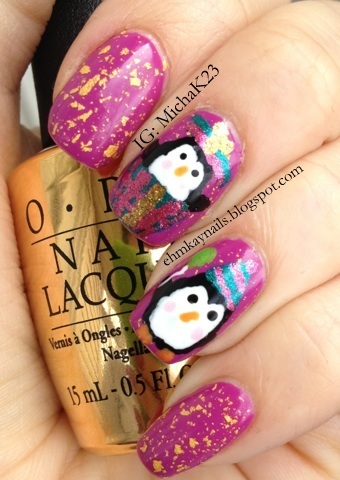 She chose Essie Wild Thing which was also topped with gold flakes. Again, you'll want to enlarge these to see the details. I have so many awesome manis. Lately I'm all about the gradient with a glitter top coat. Like this one here. In September, I came across Suzi Skiis the Pyrenees Suede in CVS and decided why not?! Well, I wore it, fell in love, and decided I needed all the suedes from OPI. Well, as of today, I have my very last one in the mail on its way to me. Not bad to complete a collection from 2008, all discontinued, in less than 5 months. I am a happy girl. I started with a base of OPI We'll Always Have Paris Suede, which Jen, from My Nail Polish Obsession found for me, and made me squeal with joy! She is really amazing at finding my lemmings. Then with Lincoln Park After Dark Suede, I did a gradient on the tips. Now here's the stunner. I added one amazing coat of Red Dog Designs I Want a Hippopotamus for Christmas. 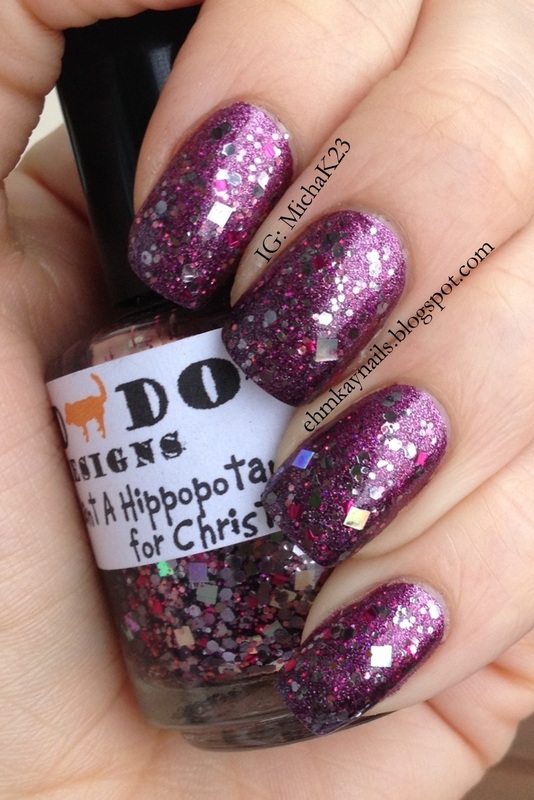 Hippopotamus has gunmental, magenta, and holographic glitters. It's perfection. This was my number one choice from Red Dog's holiday collection (but Mele Kalikimaka is a close contender) but I couldn't figure out a base. This was perfect. Trust me, you want to enlarge these. The OPI suedes are long discontinued, but Red Dog's shop is ready to open tonight, January 25th. 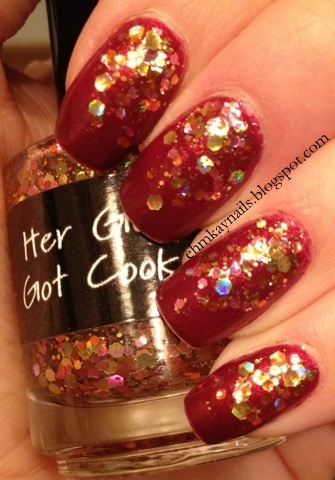 Her glitters are absolutely amazing. See The Temptress here, Mele Kalikimaka here, Eight Crazy Nights here. Can you tell I love her polishes? I have way more to show you. Her shop opens TONIGHT! You can shop her store HERE. 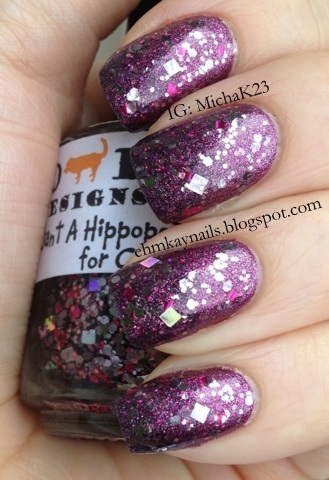 I personally have seven of her new ones I plan on getting, especially that Mardi Gras polish! Today I have what I consider a palette cleanser. I really like suede finish polishes because I love how gorgeous they are with and without top coat. Here is one of the soft touch polishes by Layla, which I actually got at Ulta. Here's a tip: these polishes are $9.95 but Ulta accepts the $3.50 off coupon on them, so I did separate transactions to get the ones I wanted at a great price. 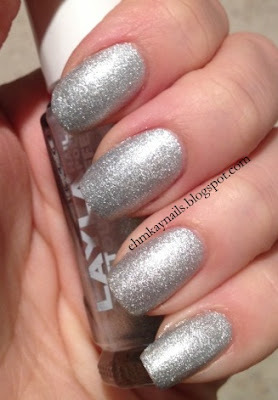 Layla Marshmallow Twinkle (01) is a gorgeous soft silver polish. It's not matte, it's not suede, it's soft. I used two coats initially. I have to mention, this did NOT want to dry on me. I'm not sure if it had to do with me doing my nails at midnight, or the weather, or whatever, but 2 hours later and it still dinged. So I added one more coat of polish, and then topped it with Seche Vite at 2am and went to sleep. The next morning I added one coat of Hard Candy matte top coat and it came out the same as Layla Marshmallow Twinkle alone. I have three more to try so I'm hoping they dry on me because they are really gorgeous! Talk about a HUGE lemming. When I first saw this Crowstoes polish, I knew I needed it and as soon as Mr. ehmkay nails squashed this lemming for me, I put it on. This was my first Crowstoes and I love it so! If you have not noticed, I have a severe weakness for rose gold and gold glitter, despite the fact that I truly dislike wearing yellow gold jewelry. 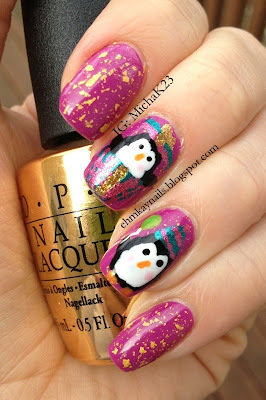 I used Nicole by OPI Stuck in the Chimney, which I bought in a mini pack on clearance last holiday season. 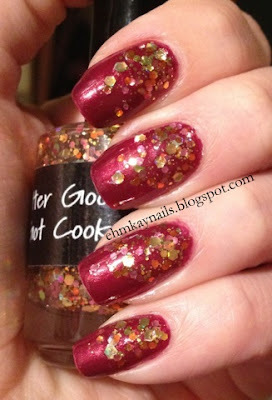 It's a gorgeous, two coater maroon shimmer. I then dabbed with the brush a reverse gradient with Her Goose Got Cooked. I wish I didn't though. Turns out, I don't like reverse gradients. But I do love this polish. I can't wait to wear it again! 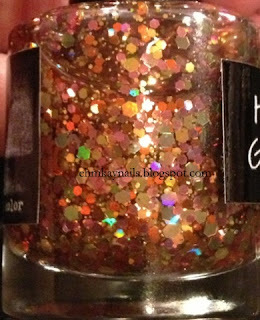 I found it difficult to capture an accurate picture of this glitter. It is blingy but also incredibly warm because of the color combination. Hopefully you see what I mean in the pictures below. Crowstoes Her Goose Got Cooked in lowlight. Very warm and the orange tones it down. Crowstoes Her Goose Got Cooked with flash. Woah Momma. First post of the year, lovelies. It only took me a week. Time off from work has possibly made me a more lazy blogger. I guess when I'm busier, I blog, which makes no sense. I have loads of manicures ready to post, just need to do it. Shall we say New Year's resolution? My real resolution is at the end of this post. 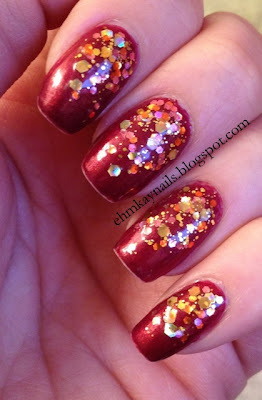 I have been doing tons of glitter bombs and today's post is no exception. I used my final Sheswai and I am slightly sad. They are pricey but very high quality. I used one coat of Sheswai stoned, which is a neutral toned polish which pulls a bit pink of me. 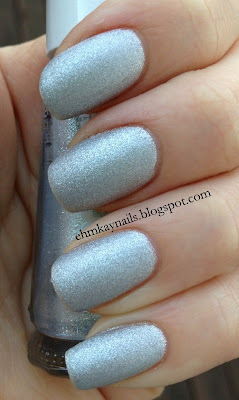 It has the slightest silver shimmer which is just enough to make it special. One coat and it's amazing! I then took Ulta Taupe on a Rope and dabbed on the tips to create a rough gradient. Trust me, you do not need perfection. While you place the glitter over the gradient, it smooths the imperfections. 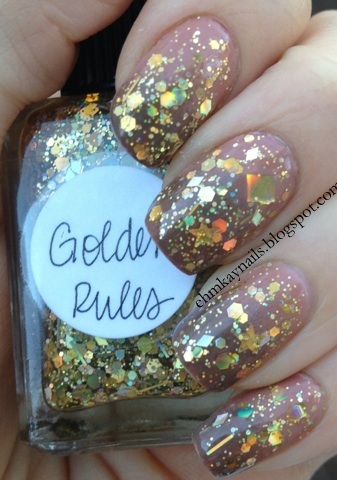 I then placed one coat of Lynnderella Golden Rules. If you didn't know, I was on a December no buy. I actually lasted 30 days until on December 30th, I saw Golden Rules for a steal and I needed it. Worth the breaking of the no buy. 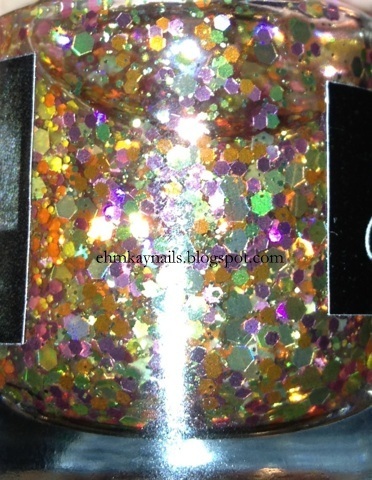 Golden Rules has an assortment of gold holographic glitters including diamonds, stars, and huge stars (check out my middle finger!). No digging needed. 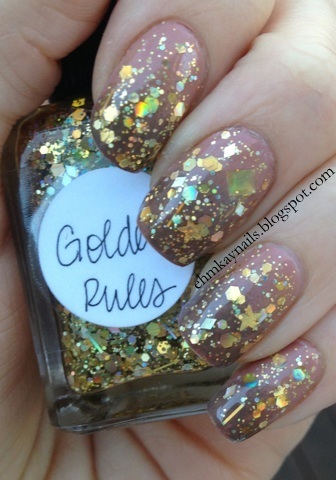 I'm not one for gold jewelry, but lately I'm loving gold on my nails! Lastly, I don't normally make any resolutions but here's mine: To finish the Ernest Hemingway fiction catalog. I am four novels away (The Torrents of Spring, To Have and Have Not (have only read the original short story), Islands in the Stream, True at First Light). Once I read these four, I have read all of his fiction! Then I will focus on finishing his non-fiction (but I have a ways to go for that). Do you have any reasonable resolutions?